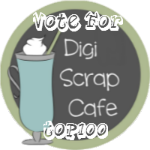 Check out the DIGI SCRAP CAFE website for everything about our services and products. Click to vote for us, or add your site to our Top 100 Sites list. Digital Scrap Sites Only Please!